Sally Shaw, founding director of Ideas for Ears, has been crowned Scottish Sensory and Equality Champion of the Year. The award recognises the person who has made the greatest contribution to sensory loss and equality in Scotland. It was made at an evening awards ceremony in Glasgow on 15 March, hosted by STV’s Kelly Ann Woodland, and organised by deafscotland, with support from Disability Equality Scotland. 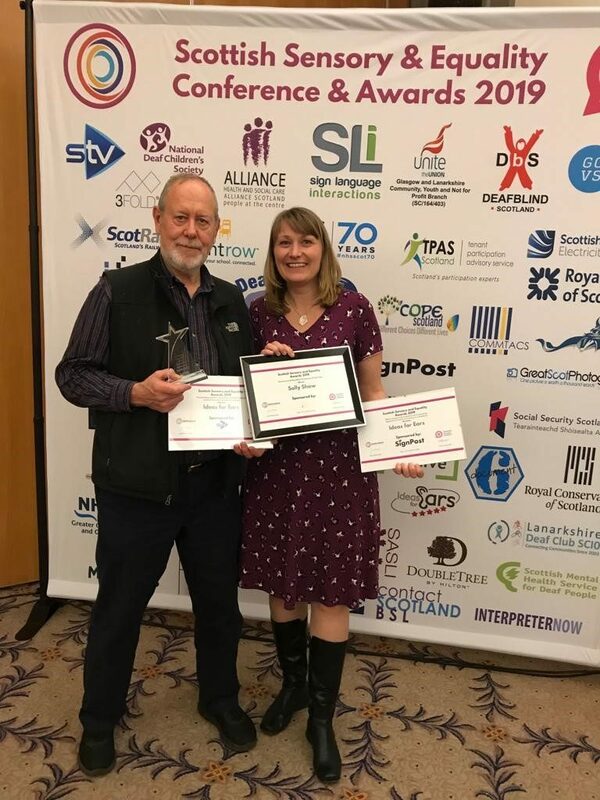 A delighted Sally commented: “It is a huge honour to be named Scottish Sensory and Equality Champion of the Year. There are many wonderful individuals working incredibly hard across Scotland to break down the barriers that constrain lives and restrict choice and access to opportunity so I was stunned when my name was read out. Sally received the award in recognition of create, develop, launch and share the Hearing Access Protocol, which sets out the guidance for how to create meetings, conferences and events that are accessible to, and inclusive of, everyone, whatever their hearing ability. Sally adds: “Hearing access has vast power to include or exclude and it does this in often deceptively simple ways.